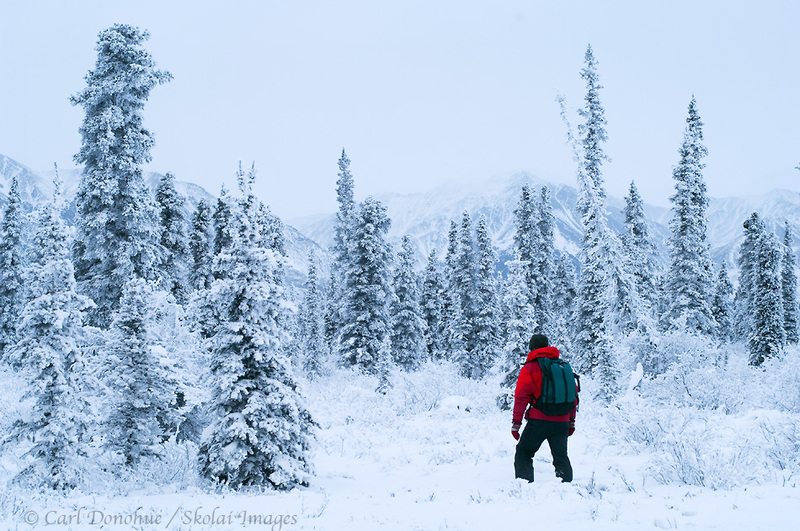 Winter travel through the boreal forest, in Wrangell - St. Elias National Park and Preserve. Hiking on snowshoes through the snow-covered taiga, white spruce forest in winter. I’m going to be putting a trip together for next spring, late March/early April, to do a snowshoe and backcountry cross-country ski trip. We’ll be staying in a cozy, warm cabin, not backpacking with tents, etc; a wood fire makes all the difference! We’ll be doing day trips out to different parts of Wrangell – St. Elias National Park and Preserve. Stay tuned for details coming soon, when this summer winds down and I get a moment to add the trip to the website. This trip will be a blast, and a great introduction to Alaska’s most awesome season. Drop me a note or add a comment here and I’ll be sure to add you to the list. This trip will be run via my backpacking and trekking business, Expeditions Alaska. Thanks. This is definitely a favorite image of mine. Posted on Sunday, August 7th, 2011. This epic photo was taken by Carl Donohue.